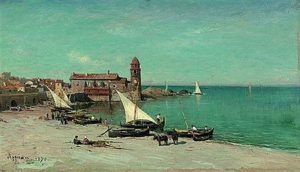 Adolphe Appian is one of the most distinguished French landscape painters and etchers of the nineteenth century. He was one of the most inspired pupils of famous painter and etcher, Jean-Baptiste Corot. 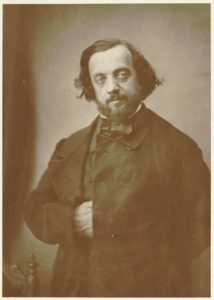 As a true successor of the Barbizon ideal, Adolphe Appian adapted his master’s sense of quality of light and used it in his own naturalistic style successfully. Born as Jacques Barthelemy in Lyon on 28 August 1819, Adolphe Appian changed his name at the age of fifteen. He attended the art school, Ecole des Beaux-Arts at Lyon, which trained candidates to decorate fabrics for the local silk industry. Later he worked as a graphic designer after opening a studio in Lyon. In the 1830s he went to Paris to study under Corot. He came to be known as a printmaker only in 1860s. In 1870 he changed his style of work and started using bright and striking colours in his paintings. 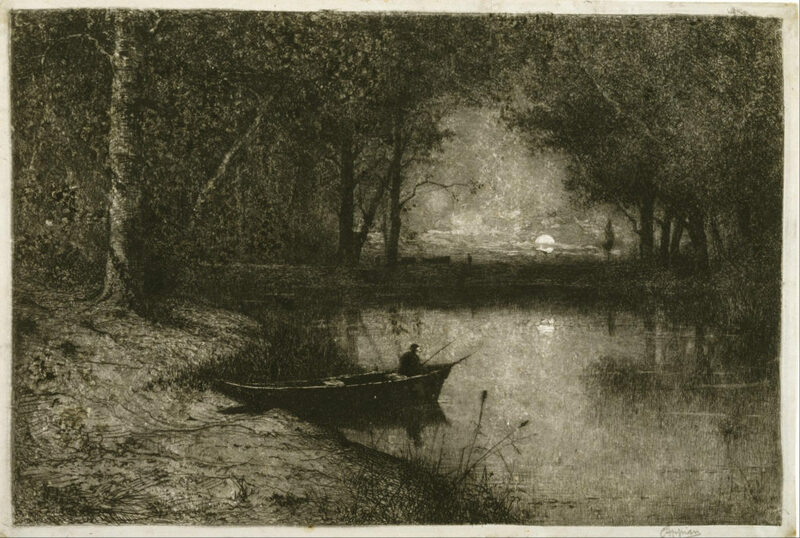 However, he did not stop charcoal drawings and etchings of landscapes in Barbizon style. Although Adolphe was a painter, his skills included other mediums of paintings like charcoal drawings, etchings, watercolours and pencil drawings. He was fond of nature and all through his life he painted remote regions of France like Pyrenees and Auvergne. 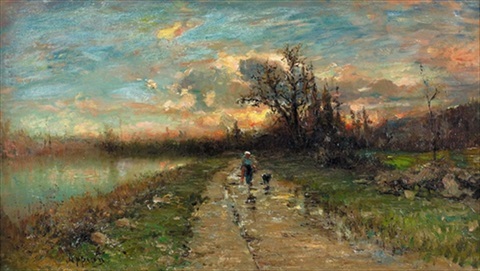 He perfected his technique of working outside in nature with Corot and Daubigny. The way he worked on with the light in his paintings and etchings was unique which made him a distinguished artist. After studying under his two masters and following them as well as adopting their advices, he became one of the great etchers of that era. Adolphe’s etched works often show a specific fascination for the typical atmosphere that is produced by imminent rain and the reflection in clear water look as if with articulate clarity. He was awarded Gold Medal at the Paris Salon in 1888 and this established his reputation firmly. The port at San Remo is the etching that can clearly tell you why he is considered as one of the most talented etchers of the era. The Society of Aquafortistes allowed printmakers to create artistic forms by using their painting skill and Adolphe continued his contribution to its annual album at regular interval. The sponsorship helped him create 100 etchings of isolated streams and desolated beaches. Appian’s first submission was a charcoal drawing to the Paris Salon in 1853. In 1860s Appian embraced his technique enthusiastically and the decade saw etching as the main artistic form as well. He regularly contributed his etchings to the journals of that time and specially to Gazette des Beaux Arts. His position as a painter was established in 1867 when his large Salon painting Lac du Bourget was acquired by Napoleon III. This was the time when he was one of the few artists who painted sketches outdoor. He also presented lot of finished paintings and so he was associated with many younger Impressionists. Till 1871 Adolphe’s paintings were sober and he painted in Southern France, in the Pyrenees and in Venice along the Riviera and Genoa. But he became a remarkable colourist after that. It is also believed that his landscapes were influenced by Japanese art. From this time till the early 90s, he visited Mediterranean coast often. Today, his pieces of art can be seen at Cleveland Museum of Art. It was almost the same time when America had started having interest in etchings. The American artist Stephen Parrish is said to have distinct influence as an etcher. Apian received more than a dozen Gold Medals for landscapes in almost every media – drawing, painting and prints. These were presented to him at both, the Paris Salon and at the World’s Fairs in London and Munich along with in Paris. He was also elected the Chevalier of the Legion d’Honneur. His etchings and paintings can be seen today in public museums in Paris, Lyon, Nantes, Bourges, Grenoble, Amiens and many more places in the world. However, towards the end of his life, he started finding difficulty selling his paintings. He lost his child, Louis Appian. In 1989 he died in Lyon at the age of 78.